The Chain O’ Lakes, about an hour’s drive from Chicago, Milwaukee and Rockford, is a boater’s paradise. It is made up of 10 lakes connected by the Fox River and another five lakes connected by channels. This waterway system has, is and will continue to be a boating enthusiast’s dream environment protected and defended by residents, businesses, state and federal agencies. Once a summertime getaway for Chicago residents who traveled to the lakes by train, the Chain O’ Lakes now has year-round housing options ranging from modest to million-dollar custom homes. What all those living in Chain O’ Lakes waterfront homes have in common is their enthusiasm for lakeside living and water bound vessels. While water skiing or jet skies are often the stereotypical image of watersports on the Chain, the boating community is much more diverse. Those who enjoy paddle sports, sailing and fishing also enjoy the variety of lakes, as well as the upper Fox River. Bluff Lake, where the Newport Cove planned community is located, has a depth of 31 feet and 1.6 miles of shoreline, and is famed for its deep fishing holes. Canoeing and kayaking are popular on these inland lakes and rivers. Paddle sports enthusiasts can hand carry their vessels from garage to shoreline. These folks like the exercise as well as a close and unobtrusive connection with nature. They are often bird watchers as well. Sailors compare their sails to wings. These boaters love harnessing the wind. Small sailboats are often seen flying across the waters of the larger lakes of the Chain. Speedboats offer a thrill and, for the person cresting the waves behind with skis or tube, unforgettable memories. Because there are no horsepower limitations for boats on the Chain O’ Lakes, fast boats are in abundance. Weekly boat races in the summer months attract many residents and visitors. 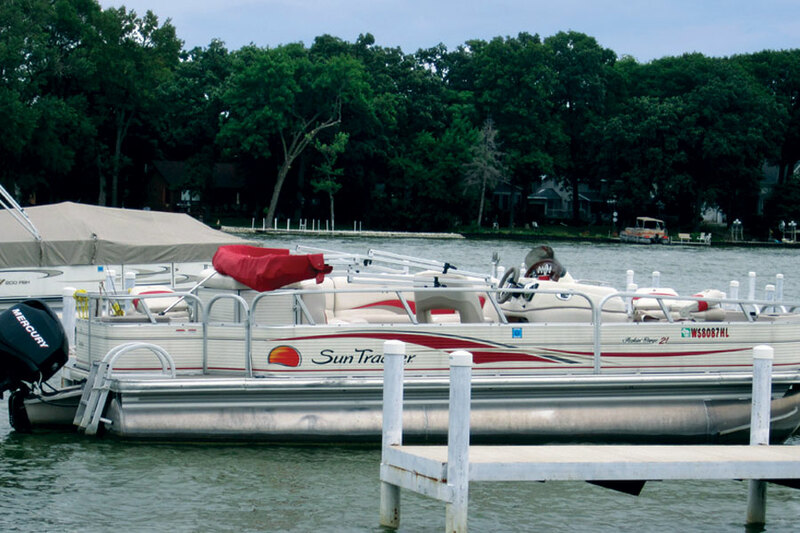 A pontoon boat can carry a small crowd across the water’s surface with little effort. Floating along with friends and family, then anchoring and taking a swim at one of the many sandbars along the Chain, makes for an idyllic afternoon. The fisherman (or fisherwoman) can be seen in small motorboats on the lakes in early morning and evening. For the determined and calculating, there is a Chain O’ Lakes daily fishing forecast that relies on solar and lunar influences. Among the fish found in Bluff Lake (according to old timers, the best fishing lake in the Chain) are yellow bass, bluegill, large mouth bass, yellow perch and walleye. Often referred to as the Key West of the Midwest, the Chain O’ Lakes is dotted with bars and restaurants. 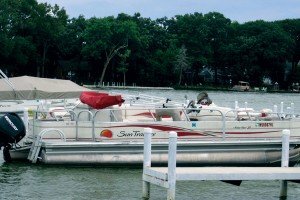 Boating to such “hot spots” as Steitz’s on Bluff Lake or the Sand Bar on Lake Marie is a summer tradition. 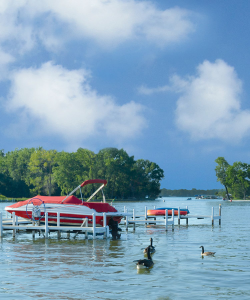 Establishments throughout the Chain (everything from a McDonald’s on Fox Lake to the famed Blarney’s Island in the center of Grass Lake) cater to the boating community by providing pull-up-and-tie-up marinas. Chain O’ Lakes boaters stay abreast of current boating conditions and weather forecasts at the Fox Waterway Agency website. Residents of Newport Cove can dock their watercraft of choice at our community’s private marina. It is a safe harbor, anchored by a place called home. To learn more about lakefront living, Newport Cove’s lake homes and boating on the Chain O’ Lakes, email us or call 847.726.2727.